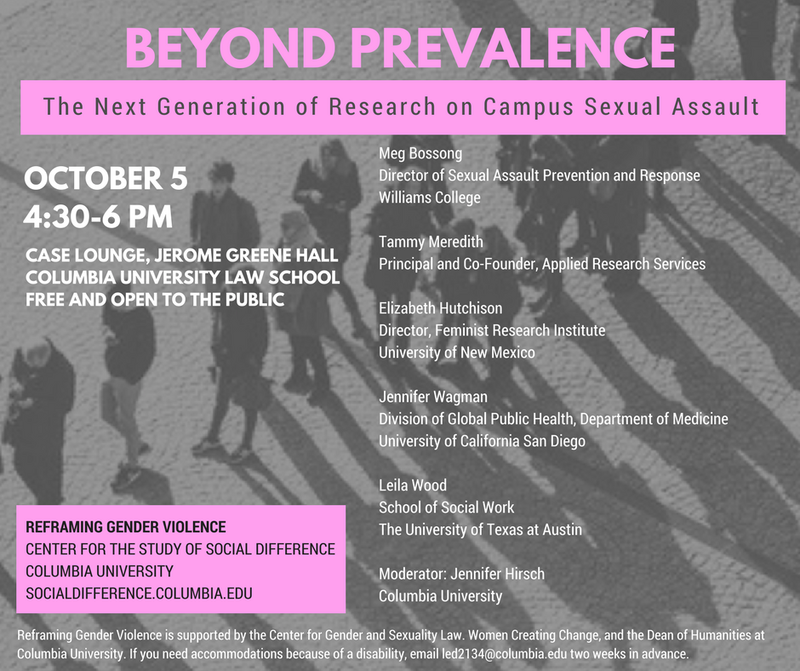 On October 5, leading researchers from across the country will present at the panel, “Beyond Prevalence: The Next Generation of Research on Campus Sexual Assault.” The panel’s organizer and moderator, Professor Jennifer S. Hirsch, is co-Principal Investigator of Columbia’s ground-breaking Sexual Health Initiative to Foster Transformation, which has been studying sexual assault and sexual health among Columbia University undergraduates. The October 5 forum is part of the Reframing Gendered Violence series of panels and seminars applying critical perspectives from the social sciences and humanities to gender violence. Reframing Gendered Violence is a two-year-long project of Columbia’s Center for the Study of Social Difference and is supported by a grant from the University’s Dean of Humanities. Grounded in the idea that a consensus has emerged that campus sexual assault is a serious public health problem, and that innovative and effective prevention requires research that both includes and extends beyond simply measuring the scope of the problem, the panel features Professor Elizabeth Hutchison, from the University of New Mexico’s Feminist Research Institute; Professor Leila Wood, from the University of Texas at the Stevie Hicks School of Social Work; Professor Jennifer Wagman, from the University of California at San Diego’s Division of Global Public Health, and Dr. Tammy Meredith, Principal and Co-Founder of Applied Research Services, co-presenting with Meg Bossong, M.S. from Williams College. The panel, to be held on Thursday October 5 at 4:30 pm in Case Lounge of Jerome Greene Hall at Columbia University’s Law School, 435 West 116th St., will include new and emerging work on environmental drivers of sexual assault, a historian’s perspective on the institutional challenges of conducting research on campus sexual violence at universities seeking to comply with Title IX guidance, and research that shifts the focus from the characteristics of survivors to modifiable characteristics of perpetrators and social situations.